What do we expect from Israeli Cinema? The 10 or so films produced each year in Israel all tend to benefit from ‘soft money’ – funding from public sector organisations in Israel or for European co-producers. Many of the films tend to be ‘internationalist’ in outlook so that they are accessible to film festivals and arthouse distributors around the world. These tendencies have been criticised as leading to a ‘formula’ in terms of style and to a focus on what are seen as ‘peripheral’ subjects – meaning not that the subjects are unimportant, but that the stories are about Israeli Arabs, contact with Palestinians, ‘marginal’ figures in Israeli society etc. I’ve seen Ushpizin described as belonging to this group, even though, for those outside Israel, it looks on the surface as if it is offering a glimpse of a specifically Israeli community. In fact (like many films) it is both ‘local’ and ‘universal’ and the characters it depicts are both ‘marginal’ and ‘only human’. ‘Ushpizin’ refers to ‘visitors’ who should be welcomed in during the Orthodox Jewish festival of Sukkot which commemorates the period spent in the wilderness by the Jews after the Exodus from Egypt. Families erect temporary huts in outside yards where meals are taken and families will sleep for a week. Visits to the synagogue must be made with the men carrying four items (‘four species’) symbolising the resources available in the wilderness – myrtle, palm, willow and citron. There is much symbolism in all of this, explained in detail on various Wikipedia pages. The film focuses on a couple living in a Hassidic community in Jerusalem (references are made to ‘Breslau’, which my research suggests actually refers to a town in Ukraine, not the German/Polish city, as the origin of the particular style of the rituals in the film). The couple have run out of funds, since as tradition demands, the man is studying and the woman is not allowed to work outside the home. 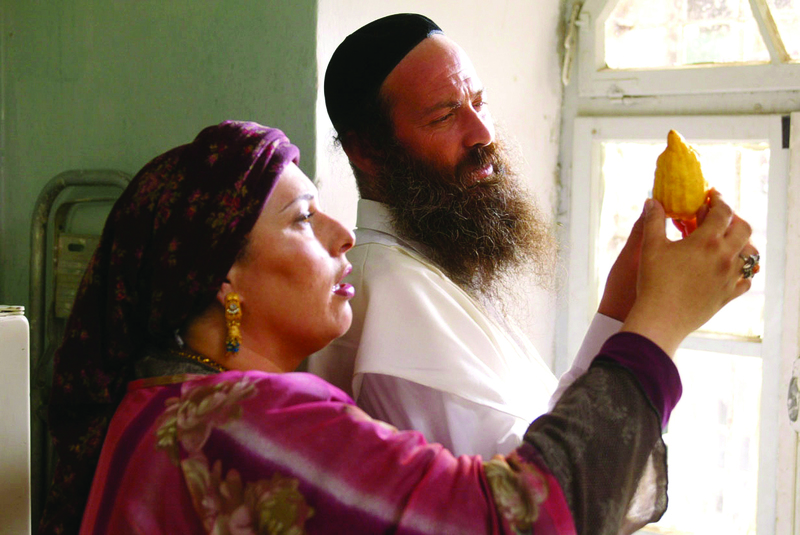 They fear that they won’t be able to celebrate Sukkot and that their prayers for a child will not be answered. However, two pieces of good fortune provide both a temporary dwelling for Sukkot and the funds to buy food and the ‘four species’. They also receive an unexpected visit from two men, only one of whom is known to the husband. This visit proves the catalyst for a series of events which will transform the couple’s life together. Once I got past the details of the Orthodox life-style – which wasn’t as unfamiliar as I expected – I realised that this was actually a well-known narrative premise. I was reminded of the Jewish stories that have come out of Eastern Europe and seeped into Anglo-American literary culture. The focus on the citron (devout Jews are supposed to buy the most ‘perfect’ specimen they can find within their means) seems to fit many such stories. The ‘visitors’ are characters from many plays and films – seemingly sent to the couple as a ‘test’ of their beliefs and integrity and their self-knowledge. The same story could have taken place in many communities. The ‘authenticity’ of this particular representation lies partly in the fact that the couple are played by a real-life couple who like the characters in the film are relatively recent converts to the Orthodox Jewish lifestyle. Shuli Rand who plays Moshe, the husband, retired from his acting career when he converted and presumably returned for this role (he also wrote the script) because he believed it would promote understanding. The director, Giddi Dar, is, I think, a secular Jew according to the reviews. I enjoyed the film and it certainly kept my interest as an unusual drama with touches of social comedy. I was also intrigued by the various reviews I found. Mainstream critics and reviewers tended, I think, to be a little condescending to the film, giving it quite high ratings but not really attempting to explore what it meant. Jewish audiences seemed very grateful that somebody had put such a story on the screen. I’m not sure what I think about it as an Israeli film. It is set in Jerusalem (which was the pilgrim city for the original celebrations) and Orthodox communities are gradually moving into the city with the possible outcome that there will be clashes with other communities, especially in the old city. But there are relatively few references to the details of Israeli life today, except for mention of one location in the city as being ‘where the Iraqis are’. Moshe is said to come from Eilat which is down on the Red Sea. I find these little sociological details fascinating, but I guess it is wrong of me to want more of a sense of what other, secular, Israelis make of communities like this – and how different or similar they are to Orthodox communities in the UK and North America. This entry was posted in Film Reviews and tagged Israeli Cinema. Bookmark the permalink.